Follow the setup instructions in the main rulebook for the human players and do the setup steps in the Automa rulebook for each Automa (e.g. they each get their own faction mat and units). If you play with multiple Automas, then it's easier to manage if they're all the same difficulty level, but they don't need to be that. If you have multiple Automas with the same difficulty level, they'll each have a marker on the star tracker (you can print out additional trackers instead if you want to). Ideally, you'll have a deck of Automa cards per Automa, but you can make do with only one deck. 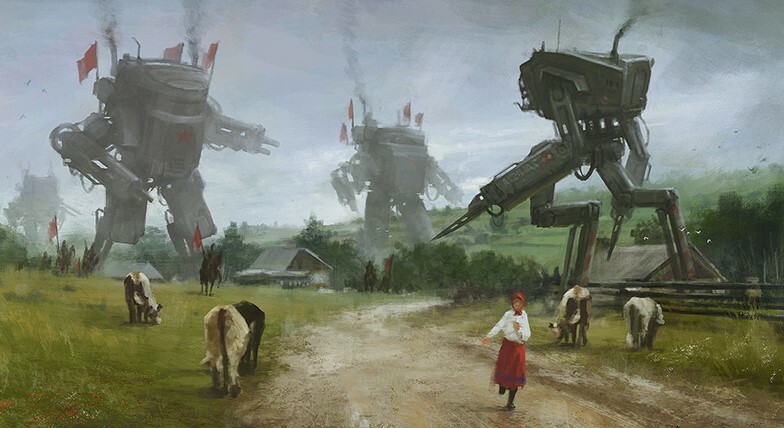 A lot of the Scythe Automa rules refer to Automa units. When playing with multiple Automas you should interpret this as referring only to the units of the Automa that's currently active. i.e. : when the Move Worker rule states that the destination hex is the "valid hex that is in the neighborhood of the most Automa units [...]", then you should only consider the Automa units belonging to the Automa that's performing the move action. Take turns like you would in the multiplayer game, with the Automas each taking their turn as a separate player. If you have enough decks of Automa cards then let each draw from a separate deck. If not then all Automas draw from the same deck, but they still get separate cards. With just one deck you'll have to reshuffle more frequently and you can have bigger variations in how the Automas plays. Unless otherwise noted the Automas are treated like Human Players, e.g. each Automa takes its place in the turn order, has its own units, places its own stars, etc. Your ongoing recruit bonuses are only triggered by card draws of Automas that are actually neighboring you, just like if it was a multiplayer game with only human players. The star tracker cards and phases As mentioned above, each Automa will have its own marker on a star tracker card. The marker of each Automa is moved forward independently of that of the other Automas, based solely on the Automa cards drawn during its own turn. The Automas will score stars independently and start using Scheme 2 independently of each other. If combat happens between two Automas then each draw their own Automa card to determine the amount of power and combat cards used. The winner is determined as normal, but no resources are placed as a result of the combat. If you conquer a territory owned by an Automa then how many resources are placed on the hex depend on whether you use one Automa deck per Automa: If you have one deck per Automa then place resources equal to the number of resources on the last Automa card used by that Automa that wasn't used for combat. If you only have one Automa deck then place resources equal to the number of resources on the last Automa card used by any Automa that wasn't used for combat. In a competitive game the "enemy" will be any other player like the normal multiplayer game. In a fully cooperative game any human player will be considered the "enemy".